Your project, your passion, your light ANSMANN stands for quality and reliability! We have set ourselves the goal of developing high quality products for professionals. The WL200B is a professional workshop lamp with the latest SMD LED technology and small auxiliary light on the lamp head The handy and reliable lamp integrates itself seamlessly into challenging everyday use, for work on lifting platforms, inspections, in workshops, industry, household, yard or garage. High performance lighting power The lamp creates an intensive white light through the use of the latest SMD LED technology. 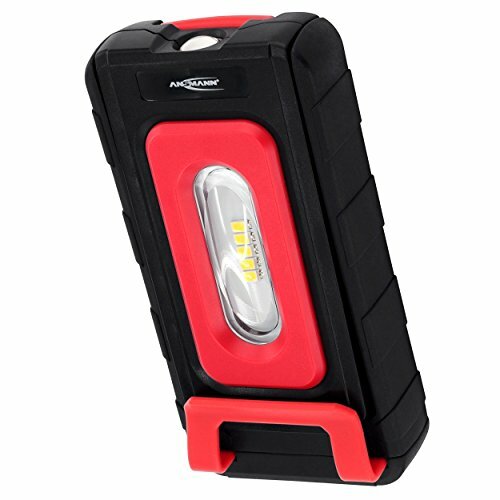 The bright main lamp produces a brightness of up to 220 lumens at a distance of one metre from the working area. Thanks to the wide beam angle, the bright light is uniformly distributed so that both large surfaces and the smallest of details can be homogeneously illuminated. An additional LED on the head of the lamp offers a powerful, precision light, ensuring that nothing is overlooked. The light from the LEDs has a color temperature of ca. 6500 K, which does not overly strain the eyes. This means a pleasant natural white light that enables comfortable working without causing fatigue. Ergonomic design concept through and through The robust and impact resistant housing is particularly resistant to mechanical stresses. With many practical tricks, the WL200B is an absolute all-rounder, ideal for versatile end-users. It has a bow handle that can be swiveled through 360° and can be locked in twelve positions for flexible direction of the light.